This is a great non-fiction book for kids—not only is it informative but it’s fun to read and filled with so many cool facts, almost 400 pages worth! Salt was once such a rare and precious commodity that it was traded for equal amounts of gold. Sneezing is just an extreme form of breathing. The most chronic fit of sneezing was from an English woman who caught a cold and started sneezing on January 13, 1981… and stopped 978 days later! The longest word has 1913 letters and stands for a chemical compound. These are just samples of some of the weird facts taken from the answers to questions that aren’t obvious to answer. My kids particularly liked the intriguing facts about inventions, the fascinating facts about sleep and the strange stories about science. We went through the book and chose the topics and questions that interested us. Some stuff was just plain gross for my daughter or too difficult for my 6-year-old son to understand, so we skipped those and moved on. I especially took an interest in the section about holidays as I have studied their origins in depth. I was pleased to find that the information was accurate. If you have a kid who loves to learn new things, or who prefers reading short excerpts that explain things, this book is sure to please. Oh, and here's the answer to the question taken from the title of this book: "The average human head weighs about 7.5% of a person’s body weight. So if you weigh about 40 kilos, your head weighs around 3 kilos (6.6 lbs). So when you get tired of holding your head up high, you now know why. It’s heavy!" When a kid loves a certain subject, he will have lots of questions. My 6-year-old boy loves dinosaurs. I do too. When I was a kid, I read everything I could get my hands on that taught me about dinosaurs. But no book gave me some of the answers I found in this book. Dino-Why? The Dinosaur Question & Answer Book is a perfect non-fiction book for curious kids because it has the answers to common and uncommon questions kids wonder about, such as: Is it possible to clone a dinosaur? Which dinosaur would make the best pet? How do you know where to look for dinosaurs? And check this one: If I stepped on a dinosaur tail, how quickly would it react? Cool questions, huh? I bet it never crossed an adult’s mind to ponder on such things. That’s why this book is so great for the inquisitive kid! Can you see why kids would love to read the answers? These are definitely kid (and sometimes … ahem … adult) questions. Best of all, the answers are short and to the point—no long-winded explanations, which is not to say the answers aren’t well written or satisfying. They are. They are also intelligent. I had to explain certain terminology to my son. Thank goodness for the glossary of dinosaur terms in the back of the book. If you are a Christian, some of the explanations regarding evolution might not agree with your own knowledge. These can be easily disregarded and your child will still benefit from the scientific discoveries regarding palaeontology. I also liked that the author uses comparisons with things or situations that a child could easily comprehend or relate to. For example, when answering the question Did long-necked dinosaurs get a neck ache? the author begins by stating: "If the stretched-out sauropod Mamenchisaurus ever tried to board a school bus, its head would hit the back window before its front feet even got past the driver’s seat." How’s that for giving a child an idea of how long that dinosaur’s neck really was! The book is filled with illustrations, photos and quizzes. It is colourful, informative and the layout simple enough to go through the pages and randomly read the info. This book is a great addition to the many dinosaur books that already occupy our bookshelf and would be an excellent addition to public and school libraries. So if your kid is a dino fan, this is THE book to get. Disclosure: Thanks to Kendal Gerard from Owl KidsCanada for sending me this book for review. I was not compensated in any other way, nor told how to rate or review this product. My son would have loved these books and then driven us crazy with facts from them. Actually, I would have too! 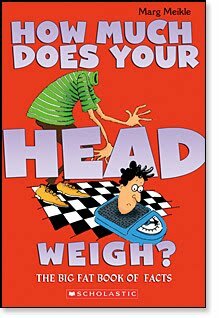 The cover of How Much Does Your Head Weigh? is fabulous! I love books filled with fun facts! Both of these look terrific. My 6 year old just came home this week and told me he liked non-fiction books. 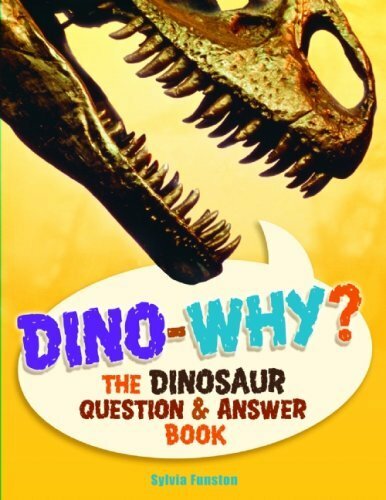 My son would love the Dino-Why book! I may have just found a Christmas present for him.